Every time a human-size household door is opened to let a dog or cat in or out, the air inside the home blends with the air outside. That means, in winter cold air will mix with your heated indoor air and cool your house, and in summer, heat comes in. 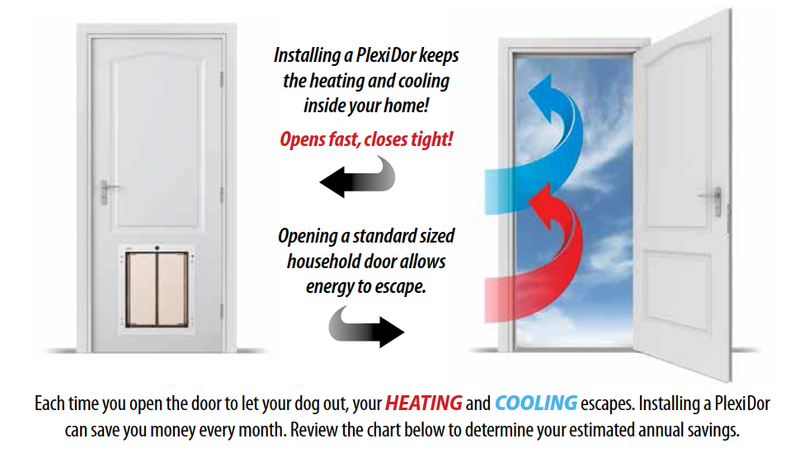 A well insulated pet door like the PlexiDor saves the most. The panels on a PlexiDor are molded to form a dual thermo-pane that insulates, and the panels are lined with high density nylon pile weather seal to stop drafts. The doors close tight to keep weather outside. Many customers from extreme climates report minimal loss in heating and cooling after installing a PlexiDor.